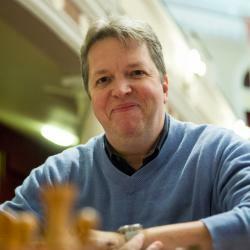 One of the best players to come from England, Nigel Short was a chess prodigy whose rise to the top of the chess world was meteoric. Gaining worldwide notice before he hit puberty, Short broke Bobby Fischer’s record for youngest International Master in history at the time. He even able to face off against Garry Kasparov for the World Championship at the height of his playing career! Nigel Short was a chess prodigy who gained the attention of the media when he was 10 years old and defeated Viktor Korchnoi in a simultaneous exhibition game. Before he was 12 years old he had qualified to play in the British Chess Championship and at 14 years old he tied for first place in the same tournament. In 1979 he became an International Master, breaking Bobby Fischer’s age record. A few years after this, he became a Grandmaster in 1984 at the age of 19. In 1993 he earned the right to play Garry Kasparov in the World Championship match and was promptly blown out in the match, losing by the largest margin in a World Championship match. Since then, Short has continued to maintain a rating keeping him within the top 100 players in the world and continues to be one of the best players to ever emerge from England.